A bald or flat tire will put the brakes on traveling quick. What is the best place to buy tires? I provide my perspective about where I purchase new tires, along with a few other options. Options abound for new rubber. There are big box stores like Walmart and Costco, along with Sears and others. There are chain tire stores, including Tire Rack and Discount Tire and many others. Online options are vast as well. Amazon sells tires, as does many other online tire stores, box stores, auto parts stores, and others. Despite all the options, I use a local repair shop. To me, they are my best bang for the buck over the course of repairs / maintenance needed for a vehicle, not just a one-time tire purchase. I prefer to use a local, independent automotive shop. My shop is not the best place to buy tires cheap, but they can provide service unlike many other box stores, I believe. In terms of cost, my local store charges more. For example, I bought a pair of 225/R55-17 Goodyear Eagle LS tires for $279.98 — or $139.99 per tire — a few years ago. It also cost $15 a piece to get the tires balanced and mounted. They offered free rotations and inexpensive / free tire repairs (depending on the issue). Yes, I paid more than the average online cost for these tires. The shop was a block away, which allowed me to walk home and not need to spend money on transportation or require a buddy or family member to take time out of their day to get me to the shop. Convenience has a price, which is worth it to me in this instance. Because I have showed them support over the years, they are more than willing to cut me a break on labor costs. And I am more than willing to give them business. They cut me deal on oil changes and repairs when I need them; once, I even got a used tire for $20 once. That cost included the tire and mounting and balancing it. A good shop — one you have a service history / relationship — will treat you right, in my opinion. To me, the slightly extra up-front cost (for a couple years) to maintain the business relationship I have with a good local shop is worth more than the few dollars I would save by buying anywhere else — whether online or at an inexpensive tire chain store. An effective solution would be to buy online and get the tires mounted and balanced at a local shop. You may not get any perks, like free rotations or tire repairs, though. From my perspective, one advantage to this technique is being able to read customer reviews and the performance and handling characteristics of a tire before buying it at a shop, where you might not have any info other than the brand and size. You would be an informed customer. I advocate doing research before buying tires. Public forums, customer reviews, or websites dedicated to tire reviews are fair game to learn the differences between models and sizes and how they perform. It is important to base your opinion on all the information you find and don’t let one positive or negative review sway your decision. Make an informed decision. Do you really need new tires? A visual inspection of your tire is important. Check them over. Is there excessive tread wear, bulging, cracked sidewalls, or anything else that looks wrong? These are all good indicators it may be time for new ones. Older tires — 10 years or more — probably should be replaced even if they don’t show aging signs. New tires won’t last long on a car that is out of alignment or has suspension problems. If the old tires have uneven wear, you may have suspension or alignment problems. 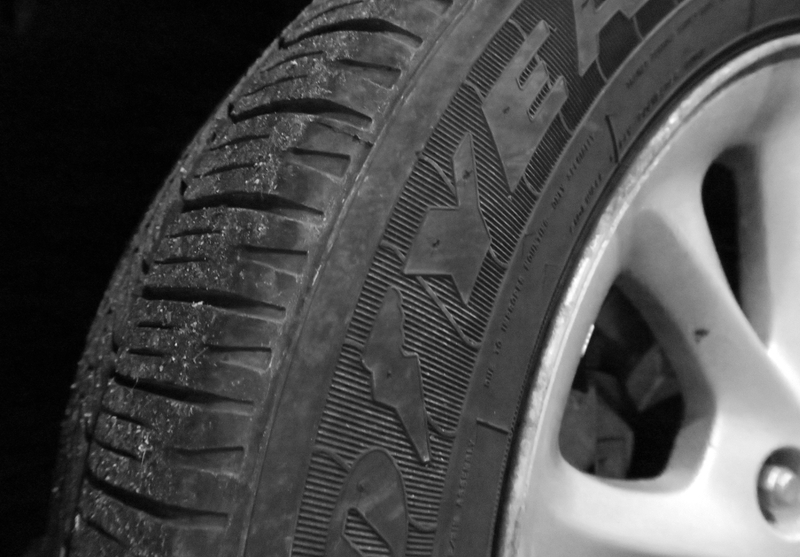 Examples include tread worn unevenly on the inside or outside of the tire. The tire should wear evenly across the tread. Consider a getting a third-party or trusted mechanic to look at your current tires / your vehicle before going to a tire shop and spending money. What size tires do you need? Rather than rely on the tire salesperson to tell you what tires your car needs, read the owners manual or use the information placard on your vehicle to find what the manufacturer recommends. A small donut spare is not for extended service. They are usually good for 50-70 miles depending on the unit. A matching spare is a great idea. If you have to change a flat, a matching spare can give you the extra time and mileage to get to a tire shop. You can also reuse the tire if a future flat occurs. A full, matching set is the best way to purchase tires. When all the tires wear evenly, you have a better chance at evaluating them and foreseeing any suspension / steering issues. I have broken this guideline, and buying matching tires does not always work. Whatever your choice, maintain all your tires. After your tires are broken in, maintain them. Keep them clean from debris and keep them inflated correctly. I hope these tips have helped, as well as my thoughts about what is the best place to buy tires. Next articleHow much does a motorcycle oil change cost at a dealer?